In this article we will study Classification and Registration of Companies and types of companies. we will discuss about different types of companies, which can be classified on the basis of formation, liability, ownership, domicile and control. On The Basis Of Formation Or Incorporation. Companies companies are those which are incorporated under special grant issued by the head of state, are known as chartered companies. The Bank Of England, The East India Company, Chartered Banketc. are the examples of chartered companies. Those companies which are formed or created by special Act of the Parliament or any state legislature. Such companies are called statutory companies, Instances of statutory companies in India are Reserve Bank of India, the Life Insurance Corporation of India, the Food Corporation of India etc. The statutory companies are generally formed for carrying public sector business. Companies registered under the Companies Act 2013, or previous Companies Acts are called registered companies. Such companies come into existence when they are registered under the Companies Act and a certificate of incorporation is granted to them by the Registrar. (iii) Prohibits any invitation to public to subscribe for any securities of the company. (b) Minimum paid up capital as may be prescribed. (d) No number of maximum limit. These are such companies where shareholders promise to pay a fixed amount to meet the liabilities of the company in the case of liquidation. A company not having any limit on the liability of its members as in the case of a partnership or sole trading concern is an unlimited company and they are free to purchase shares. If such a company goes into liquidation, the members can be called upon to pay an unlimited amount even from their private properties to meet the claim of the creditors of the company. A government company is a company in which at least 51% of the paid up capital has been subscribed by the government. If the government does not subscribe a minimum 51% of the paid up capital, the company will be a non-government company. A company, which is registered in a country by restricting its area of operations within the national boundary of such country is known as a national company. Aforeign company is a company having business in a country, but not registered in that country. Multinational companies have their presence and business in two or more countries. In other words, a company, which carries on business activities in more than one country, is known as multinational company. 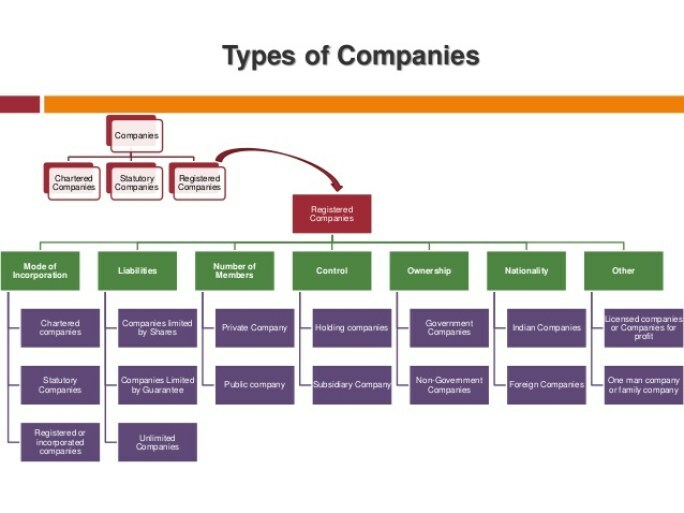 A holding company is a company, which holds all, or majority of the share capital in one or more companies so as to have a controlling interest in such companies. A company, which operates its business under the control of another company (i.e holding company), is known as a subsidiary company. So we have studied Classification and Registration of Companies and types of companies and if you have any queries please let us know in the comments section below.